Welcome to my monthly series where I share my blog stats and income with you. I was inspired to do this because I know of some bigger bloggers (like Pinch of Yum) who share their blog stats and income but I really didn’t see any smaller bloggers (like me! and maybe you!) who do so. I figured if I was looking for something like this, others might be as well, so I decided that I’d start sharing my monthly stats and income. 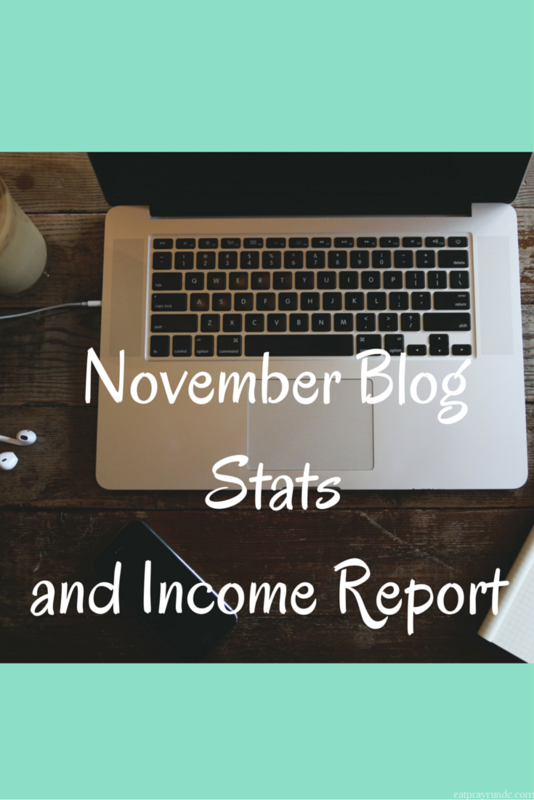 Here’s my November blog stats and income report – I hope you find this helpful (you can find October’s report here)! As I mentioned in last month’s post, I track and report my income on the blog as it comes in, with the exception of ad income – which I report for the corresponding month, even though I won’t physically see that income until later. This means that I’m reporting income on sponsored campaigns and affiliate links that likely happened a few months ago (as that’s the general timeline for payment). November, like October, happened to have a confluence of a lot of campaigns sending me payment, which is why the income is SO high. I’ve been trying to be strategic about doing fewer sponsored campaigns but doing campaigns that pay more. Like anything, it’s cyclical and I don’t expect to have any campaigns paying out in December, so next month’s income report will look far different from this one! As far as pageviews, as the temps continue to drop, my most popular post on Pinterest (giving some tips for cold weather running) starts to get traffic again, and with over 20k pins, some of that traffic comes back to the blog. I’d like to continue to see an increase in numbers through the rest of the year. Right now, it’s looking like December will be just about the same as November in terms of pageviews, but I have to see how it shakes out. Tips on Running Richmond. This post got a lot of traction the week before the race. It’s one I’ll read again before I head back to Richmond next fall, that’s for sure! Richmond Half Marathon Race Recap. Race recaps are always well read and I did a linkup for other Richmond runners, which was fun! And this post on What Race Directors Actually Do. This post was a fun interview and I think answered a question that many of us runners have! This past month, my top three referral sources were: 1) direct sources; 2) Pinterest and 3) Facebook. Facebook is a funny thing. I’ve been getting quite a bit of traffic from Facebook lately and it’s an interesting study in how an area that can be so fickle. Having an organization share one of your posts via Facebook can really cause it to take off. That’s definitely what happened with my Tips on Running Richmond post! I’m pleased to report that I’m in the final stages of editing my ebook that will be released very very soon! I’m excited and also kind of nervous because this is all so new for me. As I mentioned previously, you will still see occasional blog tips as well as this monthly stats post post, but starting sometime in early 2016, I’ll be moving most of my blog tips to a subscription list that will also contain some other fun things (i.e. it will not be an email just listing my blog posts – that’s what Bloglovin is for!). Get excited, y’all! What blogging related questions do you have that I could potentially answer for you? This is awesome, thanks for sharing! I’ve often wondered how bloggers make money or use their stats for growth. Nerdy of me, I know 🙂 love your blog and all the tips! This is so awesome to see, especially for a newbie blogger like me! I’m a little lost on how to put my blog ‘out there’ more and team up with companies. Thanks for sharing Courtney! Looks like a great month for you! I’m getting a lot more hits and campaigns but none of them have generated any income. My biggest source of frustration is the huge amount of hits from spambots I’ve been getting this month. I’m putting comment moderation and I’ve blocked them from my stats, but other than that, I don’t think there’s anything else I can do. I need to figure this out. Girl, I still can’t get over the fact that your post has over 23,000 pins! That is amazing! It picks up again every winter! Always amazes me! This is awesome info! I haven’t been able to figure out the income part of my blog yet but it’s definitely something I am working on in the coming month. Time to start making this blog pay for itself, I think. Runwright recently posted…What Do The French Really Have Over Us? Hi Courtney! I’d love to know more about your campaigns that you’re working with. Are they fitness oriented or ones like IZEA? I came over from Blogdacious’ income report. I think I’ve finally hit$100 from Google Adsense and that’s the first bit of money I’ll be seeing since I started 10 months ago! I love blogging so I’m not in it solely for the money, but it would certainly be nice to bring regular income in! I’ll sign up and see what kind of tips you have! Wow, November was a great month for you. Congrats!